PanARMENIAN.Net - The number of transit flights carried out via Armenian air routes has drastically increased, the General Department of the Civil Aviation (GDCA) said in a statement on Monday, May 7. In particular, 12 new air companies have entered the Armenian market in the past 2 years, which are: Armenia Aircompany, Brussels Airways, Qatar Airways, Wataniya Airways, Germania Fluggesellschaft, Arkia Israeli Airlines, Cham Wings, Air Cairo, Turkmenistan Airlines, Red Wings, Nordwind Airlines, Pobeda. 12 new routes have launched, with the carriers now lying to Lyon, Brussels, Doha, Kuwait, Berlin, Prague, Tel Aviv, Damascus, Sharm-el-Sheikh, Ashgabat, Frankfurt and Astana. Passenger traffic in the two Armenian airports grew by 10.4% in January-April 2018 against the same period last year, the general department of civil aviation reveals. 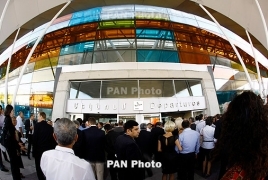 Overall, 737,861 people used the services of Zvartnots airport in the capital city, Yerevan, and Shirak airport in the northern city of Gyumri. As reported earlier, U.S.-made Robinson R66 and France-made AIRBUS EC130T2 helicopters will soon start transporting Armenian citizens and the guests of the country to the various parts of Armenia and abroad.